First opened in 1906 the Ritz hotel can lay claim to be one of the best known hotels in the world, indeed considered the finest hotel in the world by many. Affectionately known as the 'The Princess of Piccadilly'. The hotel can be likened to the feel of French country house and has accommodated scores of the most famous personalities from across the globe. Over the years restoration work has brought back the original features and their Louis XVI style. Service is a key point of the hotel and is reflected in the ratio of two staff to each guest. Further every guest is greeted by name. Each bedroom is individually decorated in an elegant English style with antique furnishings remaining true to the hotels original Louis XVI style and a decorative fireplace (in all rooms). Its also traditional at the hotel that all bedrooms are a combination of blue, peach, pink and yellow colours and make use of gold leaf. In-room amenities include high speed internet access, triple glazed windows that can be opened, safe, central heating, air-conditioning, cable flatscreen TV with on-demand movies, Bose wave radio and CD player, USA and UK modem points, minibar, alarm clock, fax point, pillow menu, direct dial telephones with voice mail and dual voltage sockets. The en-suite bathrooms come complete with bathrobes, hairdryer, slippers and luxury toiletries (Highgrove). Extra services that set this hotel apart include help with packing and unpacking of your luggage and an evening turndown service. Superior Queen: up to 20 sq metres. Superior King: up to 24 sq metres. Overlook Arlington Street and Piccadilly. Executive King: up to 30 sq metres. Have an extra large desk. Deluxe King: up to 36 sq metres. Junior Suites: up to 46 sq metres. Luxurious accommodation. Original fireplaces and silk ceilings. Deluxe Suites: up to 74 sq metres. Marble halls and deep pile carpets. Height of opulence with full sized heavy curtains and antique works of art. Room service is 24 hours. There are dedicated non-smoking floors. Fax machines and interconnecting rooms available on request. Each guest is escorted to their bedroom on allocation. Valet service between 07:00 and 23:00. Free Daily Telegraph delivered daily. All restaurants and bars have a formal dress code. Men must wear a jacket and tie. The Ritz Restaurant: Michelin star holder. A reputation as one of the most stunning of all restaurant environments with the best in service. Serves classical cuisine with modern influences, Includes a private terrace and Italian garden. On Fridays and Saturday evenings the Restaurant holds a traditional dinner and dance (called 'Live at The Ritz') to the accompaniment of a four piece band. Elegant restaurant with a formal dress code. Palm Court: This is where the most English of traditions, Afternoon Tea, is served. The restaurant offers 17 different types and blends of tea alongside the fresh scones, sandwiches, jams, clotted cream and pastries. This is often a place chosen to 'pop the question' by placing an engagement ring into a glass of Champagne. Two sittings daily at 15.30 and 17.00. Pre-booking advised. Rivoli Bar: This ostentatious Art deco style bar was opened in 2001. A little out of the touch with the hotels general style the Rivoli Bar has a sophisticated and modern feel in an intimate setting with gold and glass fittings. Stunning and contemporary setting where the décor includes camphor wood, satinwood, alabaster, gold leaf and Lalique glass. Along with its range of drinks and cocktails the bar also serves alight lunch and dinner. Open: 11.30 till midnight (Sunday noon till 22.00). The 7th floor is where you'll find the Ritz salon. This is a spa offering a range of beauty treatments such as massages, facials, manicures, pedicures and reflexology. There is also a hairdressing salon and a gymnasium with sate-of-the-art fitness equipment. Personal trainer on hand. The Ritz hotel has a family friendly policy and to this aim they have the KIDZ@THERITZ club. The hotel gives each child their very own membership card which can be used to receive their very own Welcome goodie bag. The club has its own Teen Concierge. Other benefits include free ice cream in the restaurants, kid sized robes and slippers, Milk and cookies on turndown. The hotel additionally offers a baby sitting service. The Ritz hotel has a computer with internet access for guest use and printer, fax and scanner can be requested. As well as extensive conference and banqueting facilities the hotel also has the Burlington Room which is ideal for smaller meetings of up to 27 guests. A large central table has connections for 6 laptops along with high tech audio visual equipment. As you would except from such a highly rated hotel the porter and concierge team is on hand 24 hours. Currency exchange is available 24/7. All parts of the Ritz hotel have full air-conditioning. Additional service include free shoe shine, Valet between 06.00 and 23.00, gift shop, luggage storage facilities and a dedicated 24 hour security team. Safety deposit boxes available. During your stay you will receive temporary membership for 'Ritz Club', located in the former banqueting hall it offers The Clubs Restaurant, Bar and Gaming Room. Notable as one of the few hotels in London to incorporate a casino, the Ritz casino. >More casino hotels. Nearest: Tube Station: Green Park 123 yards (112 metres), Railway Station: London Charing Cross 0.8 miles (1.3 km), DLR Station: Tower Gateway 2.9 miles (4.7 km), Motorway: M1 Junction 1 5.9 miles (9.5 km). The Ritz Hotel London is located on Piccadilly which is between Green Park and Mayfair and is a central London location. Piccadilly is a busy main road and part of the A4 dual carriageway which gives direct road access out to Heathrow Airport. It also has some great shopping with famous stores such as Fortnum and Mason and places of interest such as the Royal Academy of Arts Museum, St James's Church and the Burlington Shopping Arcade. It leads down to Piccadilly Circus which can be thought of as the tourist centre of London (officially the centre is Charing Cross Station). Green Park on the Western side of the hotel forms part of the grounds of Buckingham Palace (home to the British monarchy). Just on the East side of the hotel is an area known as St James's. This leads down to Trafalgar Square and is an exclusive area in the same mould as Mayfair. Its home to famous roads such as Pall Mall, and places of interest such as St James's Palace and the RAC Club. 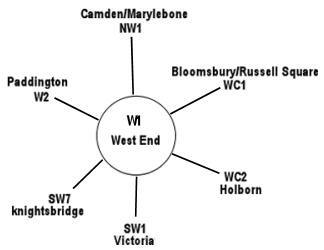 Shoppers are spoilt for choice with established shopping areas all around such as Bond Street (264 yards, 241 metres), Regent Street (0.2 miles, 0.3 km), Oxford Street (0.5 miles, 0.8 km) and Knightsbridge (0.9 miles, 1.4 km). Less than a half mile to the West is the wonderful 600 acres of Hyde Park and Kensington Gardens. Other nearby places of interest include the Michael Faraday Museum (176 yards, 160 metres), Trocadero Centre (0.4 miles, 0.6 km), Apsley House (0.5 miles, 0.8 km) and the Queens Gallery (0.5 miles, 0.8 km). Private parking is available on site and costs £60 per day. Rocco Forte Brown's Hotel: is 258 yards (235 metres) away, has a guest satisfaction score of 90% and rates start from about £415. Four Seasons Hotel Park Lane: is 0.4 miles (0.7 km) from here, earns a customer rating of 99% and base rates begin at about £590. Lanesborough Hotel London: 0.6 miles (0.9 km), rated at 99% and with rates from around £572. Halkin Hotel: 0.6 miles (1.0 km), rated at 98% and with rates from around £294. Compared to other London hotels: This hotel has been rated 90% by past guests. The London average is 80% and the average for 5 star hotels is 89%. Therefore this hotel is above average for its sector (star rating) and for London as a whole. Leading Hotels across the chain average 92% so this hotel is slightly below the guest rating for most Leading hotels. Milesfaster ranking: 52nd from 866 London hotels, 6th of 11 Leading Hotels, and 32nd of 131 five star rated hotels. We can also point you towards a lower price option, the Re Shoreditch Hotel. 1.6 miles from the Ritz Hotel London (2.6 km), achieving a rating of 74% by its past clients with base rates starting at about £67 (theres free WiFi too). The 50 hotels nearest to this location (150 Piccadilly, W1 postcode) that we list cover a 0.6 miles (1.0 km) radius. The 50 are made up of 31 five star hotels (average rating 88%), 17 four star hotels (average rating 84%) and 2 three star hotels (average rating 88%). Coming out as the top rated hotel are Haymarket Hotel (5 star), the Four Seasons Hotel Park Lane (5 star), the Soho Hotel (5 star) and the Lanesborough Hotel London (5 star) (all 4 are joint top with 99%). Base Rates: See a breakdown of the average starting (base) rates for the area. Base rates are a rough guide to starting rates as they do not include special offers and deals. The average rate for all the 50 nearest hotels is £286 per night. Starting from £79 at Park Lane Mews Hotel (4 Star, 65%) up to £1000 at 45 Park Lane Hotel (5 Star, 98%). Averages by star rating: Five Star average: £363, Four Star average: £161 and Three Star average: £161. We use a proprietary algorithm to rank hotels based on user reviews but adjusting for contributing factors. We rank Ritz Hotel London 14th (joint) of 50 nearby hotels and 11th (joint) for the 31 five star hotels in the area. In terms of lowest starting rates this hotel is 45th of 50 (26th of 31 five star hotels.). Analysing both the base rates and overall rating for the hotel we rank it 30th of 46 for sheer value for money (Haymarket Hotel was top). A report published in October 2014 by New World Wealth found The Ritz was the most popular hotel in London for multi millionaires. Purchased in 1995 by Sir David Barclay and Sir Frederick Barclay's Ellerman Investments. Following the purchase the hotel underwent a massive restoration program which last a full 10 years at a cost of £50 million pounds. In May 2007 the hotel targeted its card gift vouchers as a potential area to grow its revenue take and to this end it hired gift voucher firm 'SK Chase'. In July 2010 Anthony Lee was jailed for five years for attempting to fraudulently sell the Ritz hotel for £250 million and actually receiving a £1 million pound deposit. He had no actual connection with the hotel. At the time of its construction it was one of the few buildings to use a steel frame. First London hotel to have bathrooms in every guest room. Past guests have included King Edward VIII and Charlie Chaplin. The hotel is very much part of the UK's history having been a venue for meetings between Winston Churchill, Charles De Gaulle and President Eisenhower during the second world war. The Ritz was featured in the 1999 film 'Notting Hill'.